Green granite is one of the most common colors of granites. And it is one of the largest categories of stone also. Because, hundreds of granites are included to the green category. The color variation of the green granites starts from dark to light green shades. Tropical green granite is one of the accepted choices all over the globe. 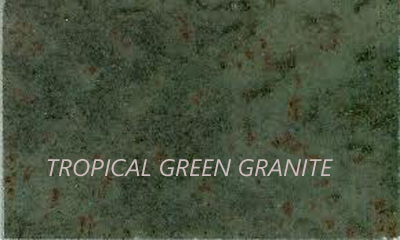 The primary color of the Tropical green granite goes to light to dark green and there are deep red flecks on it. This granite is also known as Kerala green granite. This particular granite is mined in India. But it is available all over the world. Green granites are very much trendy and the Tropical green granite is one of the accept choices to the homeowners. They use this granite widely in flooring, wall cladding, installing of kitchen countertops and bathroom vanity tops. By using the tropical green granite, the homeowners achieve a long cherished goal. Because, the eye-catching look of Tropical green granite offers a lively and authentic look to your space. Granites are famous for its toughness. And so, the homeowners think that granite does not require any kind of maintenance. But Tropical green granite is porous and so the stains make increase over the granite surface. Taking proper care of granite countertops helps to prevent the stains of foods and fluids which usually occur on it. So, tag along the following instructions. Seal your granite countertops with a saturated sealer. Read the directions of the product tag. But if you normally apply the coat, let it to dry for twenty four hours, and after that go for the second coat. Do the procedure once in every two years. Any kind of acidic foods or oils can stain the granite. So, clean away the spills as soon as possible from your Tropical green granite countertops. And wipe off the granite façade using hot water and wet rag. Do it every time after using the countertops. Use granite sealer to clean the countertops at least once in a week. Wipe away all the noticeable area of the granite with the cleaner. Don’t clean just that specific part of the surfaces you mainly use. It will offer smooth shine the total area of the countertops certainly. Polish your granite countertops every 3 months to carry on the bright and shiny look of it. Always use the polish, which is specially made for granite. Follow the instructions of the product tag to get excellent effect. Be habituated in placing coasters, hot pads, and cutting boards under any kind of cold, hot, or sharp items. Put any kind of pots or bottles on the mat. It helps to protect the Tropical green granite surfaces from the damages. Make a use of 00steel wool removing watermarks from the granite surfaces. It also applicable for eliminating the cutting marks or light scratches. Granite countertops are not only beautiful it is an asset for the homeowners also. But granite requires little concern for retaining its striking beauty.